Iris Gillon of IGMC is an expert at handling every aspect of complete wedding planning and event production. Iris Gillon is also an expert at design of all kinds of events from the earliest stages to completion. Iris Gillon, or an IGMC consultant can help you create and manifest a concept of wedding and event magic specifically directed by YOU! We are here to meet a few or all of your party, wedding and special events needs. From the selection of the location, the gown, the lighting, flowers, band, musical entertainment of all kinds, photography, video, travel, hotel arrangements, and more... you name it, Iris Gillon and IGMC can handle it, and take the work out of your party and put the fun back in your day; for YOU! IRIS GILLON SAVES YOU TIME & MONEY! Iris Gillon or an IGMC consultant can save you time and get you the best value to be found for your budget in New York City or New Jersey. Iris Gillon and IGMC can give you important information and teach you how to be a wedding expert and how to look out for hidden pit-falls in contracts, vendors and more. Iris Gillon and IGMC can help you to be an authority on wedding products and services. Iris Gillon and IGMC are your insurance of quality. Iris Gillon and IGMC can also to be there for you to insure that your special day flows smoothly. IGMC consulting sessions can be done over the phone, in our office, through e-mail or via faxing. Iris Gillon and IGMC have the largest library of quality event sites to be found in New York City or New Jersey and for 100% free, NO COST TO YOU, NO FEES, NO HIDDEN COSTS, NO INFLATED CHARGES, (none of that!) one of us can walk you through and give you a personalized tour of the best facilities to be found. For the busy executive bride, Iris Gillon or an IGMC consultant can meet you late at night on the phone or at your convenience to plan your wedding during off-peak hours, when you are home from work, relaxed, and can finally take some time to plan your wedding. FREE SITE SELECTION HELP FOR YOU! Iris Gillon and IGMC consultants know every inch of New York City, exploring museums, mansions, restaurants, luxury hotels, penthouses, libraries, historical landmarks, lofts, boats and more. Iris Gillon and GMC offer totally FREE event site selection help at all times and assistance in negotiations as a bonus as well. Iris Gillon’s long-term friendships and relationships with the local business owners and managers can serve as a huge advantage in the success and pricing of your event. There are no hidden charges for this service, no increased pricing, no fees, nothing hidden, simply this service is 100% free to the event-site shopper. What is the "catch?" Answer: In giving something of value away, we tremendously increase the traffic for our main business which is promoting live entertainment, lighting design and the very best talent that the United States of America has to offer the world. Iris Gillon and IGMC are expert at coordination, production and management of all aspects of any type of show or presentation from the building of stages, sets and handling multimedia events, to the composition of original music, themes, shows performers or any type of entertainment or presentation requirements. Lighting and visual drama are our specialty and if you review our website at www.igmc.net we have many samples of creative lighting filmed live at our parties and weddings for you to examine. Music and musical entertainment is probably one of the most important key elements to guarantee that your special day be exciting, fun and all that you hope for. If you hire an inferior band you could suffer embarrassment and a no-fun party. Your event could be ruined by hiring the wrong group! This is a very difficult decision and no other wedding or event planner in New York or New Jersey or surrounding states has a Masters Degree from The Juilliard School of Music like Iris Gillon of IGMC does. No other planner has the type of musical expertise or musical know-how the way Iris Gillon does! Booking a band or your live entertainment with Iris Gillon and IGMC will help to insure that the music for your wedding or event is all that you hope for and need! Iris Gillon and IGMC have the largest and most comprehensive library of quality bands, top-of-the-line orchestras and performers to be found on the East Coast. An IGMC consultant will make a presentation to you with videos, tapes and live shows. And since all of these performers were personally hand picked, trained and are managed by Iris Gillon and IGMC, you can rest assured that the band and entertainers will be TOP QUALITY and that all your guests will be raving about how much fun they had and how great the live entertainment was! Simply put, there is no one in the events entertainment business that has the music credentials, the event planning experience, the ear or the eye that Iris Gillon has. Iris Gillon, IGMC designs complete themes: decoration, dancers, comedians, look-a likes, entertainers of all kinds, games, shows, environments, musicals, movies or fantasy worlds. As with the music, Iris Gillon's massive experience in events production and in music, dance, drama and more lend itself fabulously well to helping you to pick the RIGHT entertainment and themes for YOU! Iris Gillon and IGMC are happy to take over the coordination and arrangements for all of your out of town guests, and plan their hotel accommodations and all the local ground travel. As we do a ton of business in and around Manhattan, we can frequently get discount packages unavailable to others. We are excited to get right to work on assisting you with your plans. To best assist us in providing quality information to you, please click on the CONTACT US button on this page to start the process by giving us your event details. 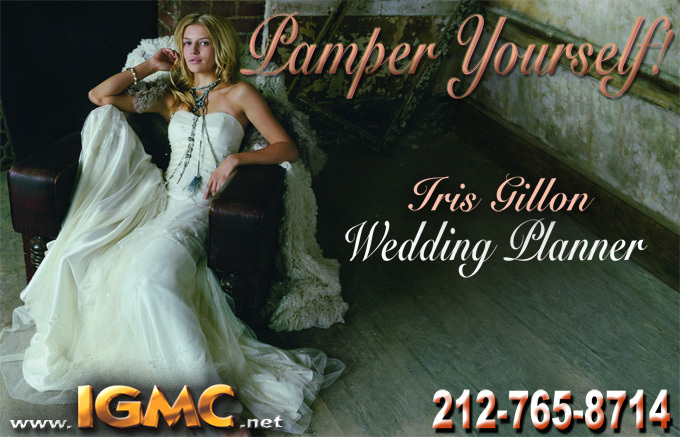 Iris Gillon IGMC Iris Gillon is known as The Best Wedding Planner in NYC. Iris Gillon helps Brides and Grooms and Corporate Event Planners to find the perfect location or catering venue in and around New York City. To see hundreds of pictures and slide shows of the top events and catering facilities in and around New York City and Northern New Jersey visit www.igmc.net and see the IGMC photo gallery featuring several thousand pictures of great party facilities. See pictures of several hundred facilities and shop in the comfort of your home with a guided tour over the phone with your private tour guide Iris Gillon. And.... did we mention? There is NO CHARGE for this service! Yes! Absolutely FREE! For More information about Iris Gillon IGMC and our FREE HELP for finding you the right location for your event simply CONTACT US and ask for Iris Gillon! WEDDING & EVENT PLANNER Iris Gillon has been involved with some aspect of over 100 Millon Dollars in Caterered Special Events! From: Corporate Events, Launches, Political Fundraisers, Movie Wraps, Weddings Bar and Bat Mizvahs and more! Iris Gillon has presided over millions of dollars of flower arrangements, lighting and theme designs and she has supervised photography, filming, production of events and products, websites, book covers and more. Iris Gillon is the top wedding and event planner in the entire United States, having participated in over 100 million dollars of weddings and corporate special events galas. Iris Gillon is know for her fabulous parties, elegant galas, celebrations, political fundraisers, anniversaries, product launches, PR events, special events of all kinds and more. Weddings Weddings and more Weddings. Iris Gillon produces the music for weddings and manages and produces 28 top party and dance bands. For wedding planning, for weddings of any ethnic background, for Jewish Weddings, for Russian Weddings, for Indian Weddings for Chinese Weddings, for Greek Weddings, for Itallian Weddings, for European Weddings, for Destination Weddings, for any type of unusual, unique or specially luxurious elegant wedding, or for any ethnic wedding including Arabic, middle eastern or from any part of the world, Iris Gillon is the Wedding and Event Planner to Choose. Wedding Planning, Wedding Consulting, Wedding Coordination, Wedding Coordinator, Wedding Planner, Wedding Manager, Wedding Producer, you name it, Iris Gillon wears all of these hats! Planning Weddings in New York City New York NYC NY New Jersey NJ Connecticut Ct Pennsylvania PA and more, Iris Gillon will also travel around the world to help you plan your event. Having planned events at all the top luxury hotels in New York City like the Pierre Hotel, The St. Regis Hotel, The New York Palace Hotel, The Waldorf Astoria Hotel, The Plaza Hotel, The Mandarin Oriental, Cipriani's, The Rainbow Room, Abigail Kirsches Pier 60 and The Lighthouse, Tappan Hill and Stage 6, Bridgewaters, The St Moritz, The Essex House Hotel, Tavern on the Green, The Private Clubs - The University Club, The Harvard Club, The Yale Club, The Harmonie Club, The Metropolitan Club The Penn Club, The New York Yacht Club and more... Iris Gillon IGMC planning weddings for The Rockleigh Country Club, The Pleasantdale Chateau, The Crystal Palace, The Venetian, The Palace in Sommerset all of those in New Jersey.